Here's the tramp, in the hole, with the net almost finished. Just a few more steps and the tramp will be done. Our next big project is curbing and mulch. I can't believe how awesome that it! That's my dream one day. 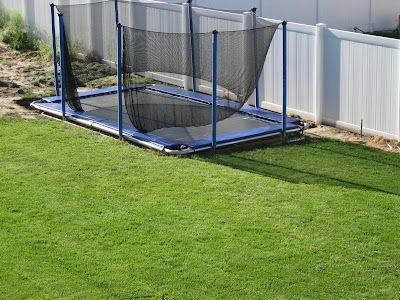 Trampolines make me so nervous, but in the ground would be perfect. Your kids are so lucky! Can't wait to jump on it in a few weeks!